BELTwalk offers unlimited design ideas at half the price of traditional leather floor & wall tiles! Cutting the leather into strips allows us to develop this magnificent leather at a 50% lower cost than if provided in squares. 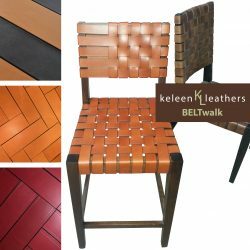 Keleen Leathers BELTwalk vegetable tanned leather flooring absorbs the traces of our life as it grows old without becoming unattractive. Therefore, it develops a beautiful patina over time. BELTwalk looks like no other leather flooring on the market. We wanted it that way. That’s why BELTwalk is so unusually special. BELTwalk is the answer to all concerns ever associated with leather flooring. ORDERING INFORMATION: All strips are 2″ wide. Each one has a beveled, painted edge for a more handcrafted, custom look. Strips are sold in random length though 80% of the amount shipped will be longer than 7 feet. Shorter pieces will adorn areas not needing full belts to reach project edges. This is what makes BELTwalk 100% usable!